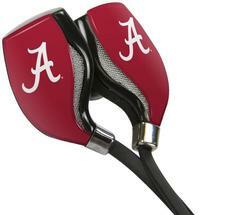 NCAA HX-200 Bluetooth Earbuds with Budbag - $49.99 - GolfersEdgeOnline.com - Best Golf Equipment On The Web! The HX-200 Bluetooth® Earbuds are the newest licensed earphones from AudioSpice. Sporting the Air Force Falcons logo, each set of earbuds has a self-contained cord design and uses Bluetooth® wireless technology. This unique design allows the user to listen to their favorite music while exercising or on-the-go without plugging in. If you have any more questions about the NCAA HX-200 Bluetooth Earbuds with Budbag; do not see the model you are looking for; need custom options; or prefer to not purchase online, then please call us at (630) 656-1291.